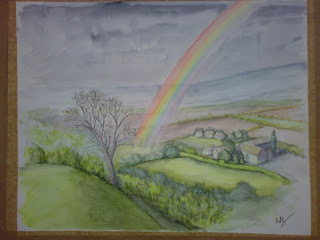 This is the latest watercolour I’ve been working on. The picture’s come out a bit dark unfortunately, but you get the idea. This is a scene from memory. The journey back from Somerset the other week was interspersed with some heavy showers. In between, there was some lovely sunny breaks and during one of these I spotted a beautiful rainbow arching over some farm buildings. This is my attempt at capturing that moment.